Boxcutters, Teaspoons, Jigger, Shaker Classic/Boston, Citrus Juicer, Strainer, Saucers, Margarita Glass. If you want to rim your Margarita glass, simply wet the rim with Lime Juice, and tap it into a saucer of Coarse Salt (we also used Blue Sprinkles for color and sweetness). Pour all of the other ingredients into an ice filled cocktail shaker. Cover, shake well, and strain into your ice filled Margarita glass. 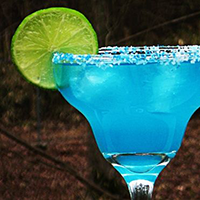 Insert a Lime Wheel (or Wedge) on the rim, and you're ready for a tasty Agave treat that will have you feeling everything, except blue... Moonlight Margarita. Bottoms up!